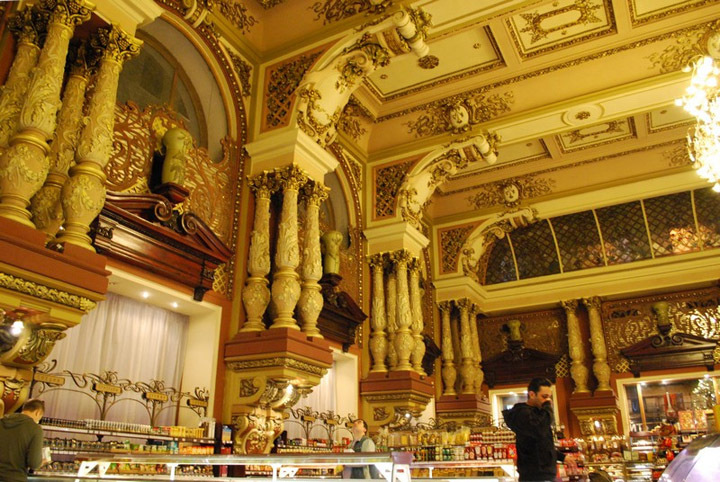 Eliseevsky store is probably one of the most famous stores in the entire Moscow. Do me a favor, if you’re strolling along the beautiful Tverskaya st., don’t forget to find that wonderful place. Muscovites always loved it. Even right after Perestroika, when all Moscow stores were completely empty, people still came to Eliseevsky to admire its beauty. Well, I guess that’s perfect justification for the proverb “Man does not live by bread alone”! Anyways, even the building of Eliseev’s Gastronome is historic by itself. It was built in the 18th century and at first was a luxurious apartment block. The owners were slowly changing until the 19th century when St. Petersburg millionare Grigory Eliseev decided to purchase it. Oh, he had a whole Moscow to choose from, from Petrovka and up to Arbat. 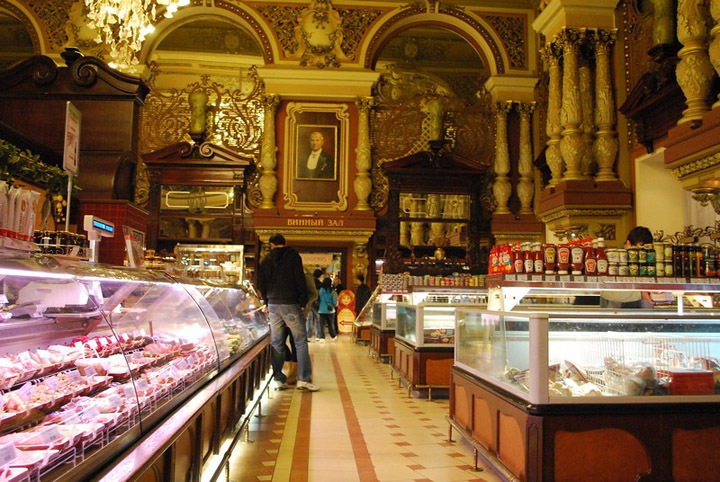 However, Grigory preferred to set up Eliseevsky store on Tverskaya. The whole rebuilding thing was completely secret. The house was covered with scaffolding, and nobody really knew what was going on inside. There were lots of rumors spreading around including the most ridiculous ones, like the one that Eliseev was building a Bacchus temple (Bacchus was a Greek god of drinking). However, the truth was that Grigory wanted to set up a store that would stun the entire Moscow. The works were finished by 1901. The gastronome was finally opened, and huge crowds of Muscovites flooded the place. No wonder – no one in Moscow has ever seen anything like that! The famous Russian writer Vladimir Gylyarovsky later wrote about his experiences. He jokingly called the store “the temple of gluttony”, and to be honest his descriptions of the place were very precise. During the Soviet times, we couldn’t believe all those tasty things were once sold there. In fact, we perceived it as just another Russian fairy tale! Let’s see what was so special about Eliseevsky store. The first two stories were turned into huge, sumptuous halls with stunning decor. Amazing fretwork, gold coating and chrystal chandeliers were more than enough to blow anyone away! In short, it was a one, big, breathtaking palace! By the way, the assortment completely matched the level of decor, as the store probably had anything that could ever come to mind. 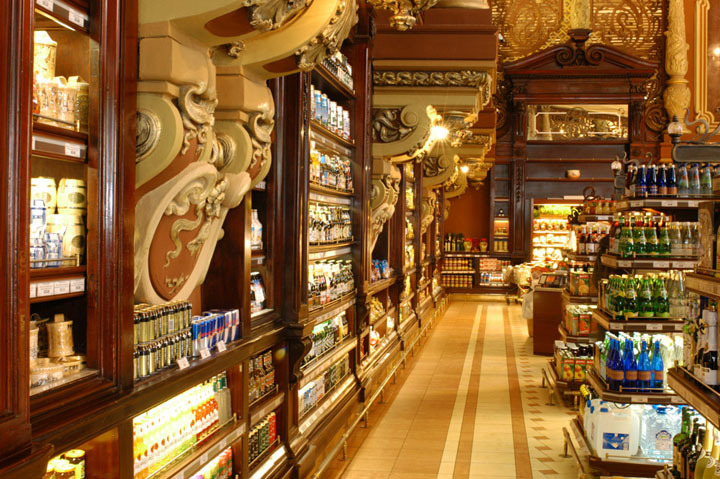 There were all kinds of foreign goods – olive oil, French truffles, oysters and more. Don’t forget that we didn’t have shopping malls in Russia back then, and many Muscovites never even heard about those things let alone saw them. However, the choice of Russian goods was no less, as you could easily buy caviar, fish, ham, milk and anything else your Russian heart desired. 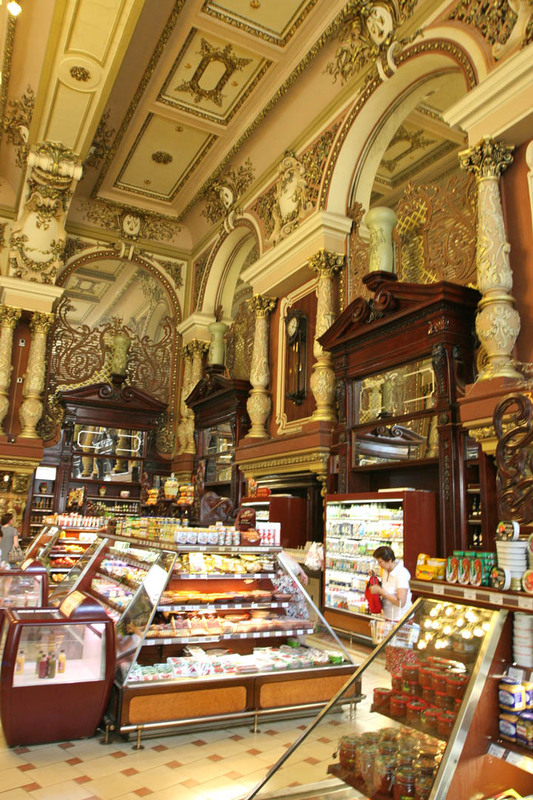 The tea and coffee department of Eliseevsky store quickly became famous, as there were many sorts of those drinks brought from around the globe. Plus, there was a bakery right in the store, and it also became very popular since the baking was fresh and very tasty. 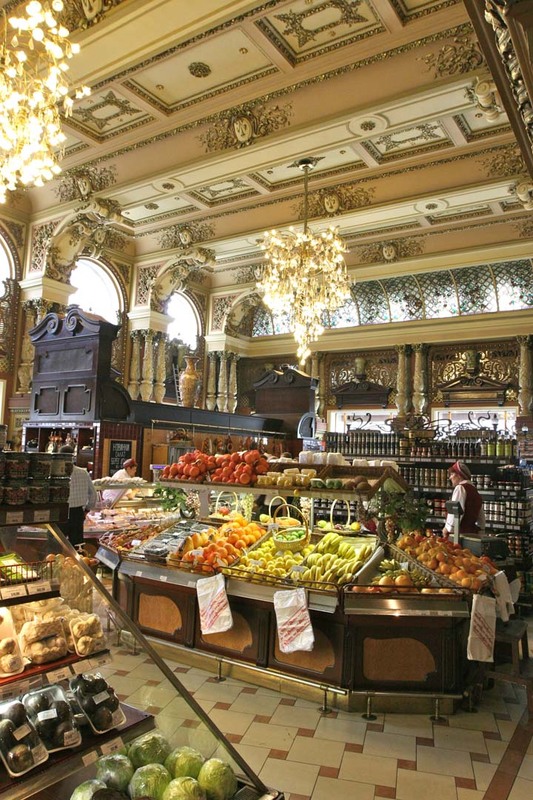 There also was a fruit department where you could buy exotic fruits from all around the globe. Until today, the thought of it amazes me – how on Earth did Eliseev Gastronome manage to pull that off? We didn’t have strong logistics back then, and yet the place had no less choice than modern retail stores. Amazing! In addition, there was a wine section in the gastronome. 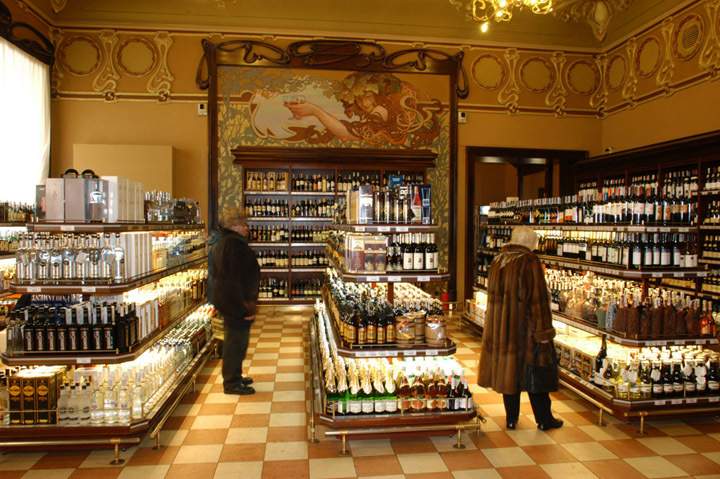 By the way, the store’s full name was “Eliseev Gastronome with Russian and Foreign Wine Cellars”, so you can say that the rumours about Bacchus Temple weren’t very far from the truth. Oh, and I forgot to tell there were so many wine sorts that it was nearly impossible to choose one without the help of the staff. The variety of goods wasn’t the only priority, as Grigory also cared a lot about the service and the design. It was his idea to put the fruits on counters in form of pyramids, and it’s been that way since then. In short, the place abided by the highest standards as even the shop assistants were educated and spoke foreign languages. Needless to say, after the Revolution the store was done for. 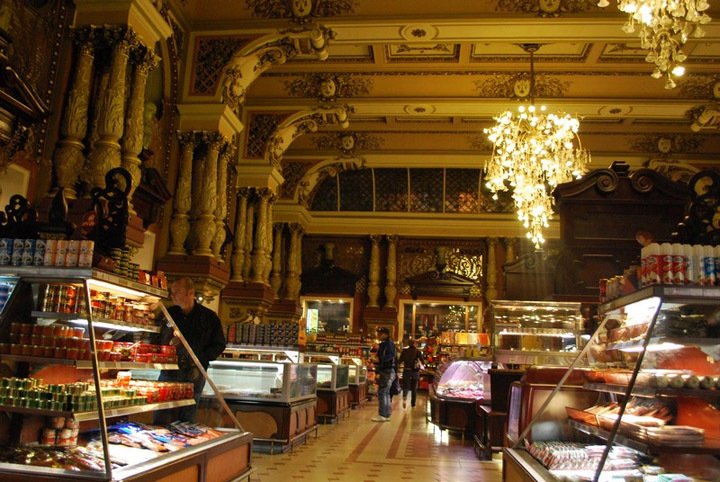 Grigory moved to France, and his former store became “Gastronome #1″. Judging by the number, even Bolsheviks respected the place. However, despite their attempts, even during Soviet times people continued to refer to it with its original name. 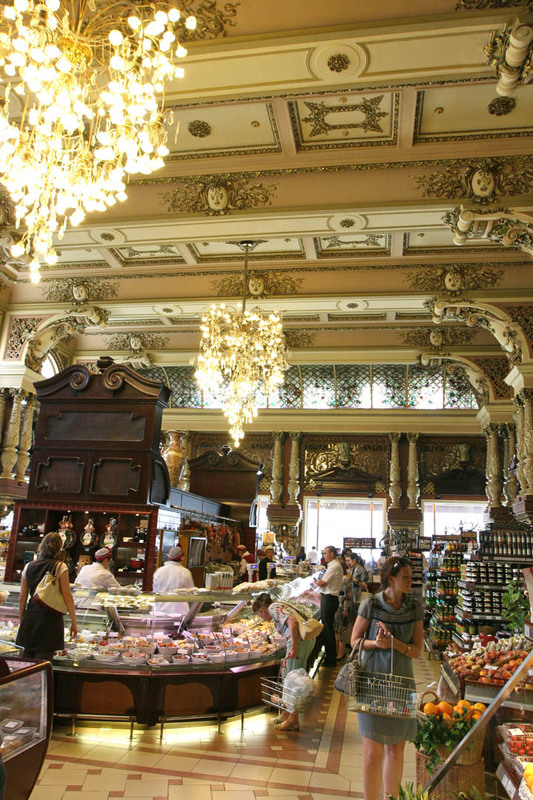 Many came from the farthest places in USSR to just look at the former Russia’s most famous gastronome, and although the decor was slowly deteriorating, Eliseevsky still retained its original charm. It was pretty weird to see all those rude, Soviet sellers with tiny amount of low quality goods inside the store. However, it’s good they didn’t close it or even demolished Eliseev’s Gastronome. After the fall of Communism, it was restored by the new owners, with all the fretwork and chandeliers put back into their place. By the way, the restoration was made using the old blueprints, so rest assured you’re aren’t shown a cheap copy. The choice has also returned, but it’s hard to surprise us with loads of goods anymore, with all those “Mega” and “Ashan” stores around. However, there is and there will be no second Eliseevsky store in Moscow, so I think it well deserves your time!